Sponge ball magic is some of the most powerful int eh arsenal of professional magicians. 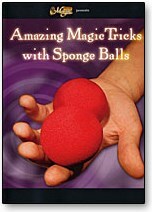 With this introductory DVD on sponge ball tricks, you'll be well on your way to mastering this astonishing branch of the magic art. De-materialize a sponge ball entirely! Visibly change the color of a sponge ball! Cause a sponge ball to jump from your fist into a spectator's!